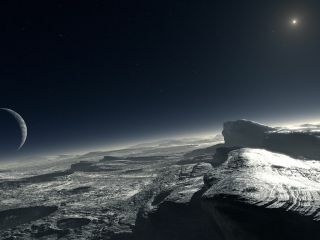 Artist's illustration of the surface of Pluto. NASA’s New Horizons spacecraft will return the first up-close looks at the dwarf planet on July 14, 2015. NASA is doing its best to make sure everyone knows that a historic spaceflight event is just around the corner. The space agency has released a video called "The Wait" to call further attention to the New Horizons spacecraft's epic flyby of Pluto on July 14. "Tonight, we are celebrating a milestone in human achievement, a moment that we are all lucky enough to share together," the host of one such gathering says in the video. "The wait is over." That wait has been a long one: Pluto was discovered by American astronomer Clyde Tombaugh in 1930, and researchers have learned little about the frigid world in the eight and a half decades since. Pluto is just too small and distant — about 3 billion miles (4.8 billion kilometers) from Earth, on average — to study from afar. But the $700 million New Horizons mission, which launched in January 2006, is about to give Pluto its first close-up. On July 14, the spacecraft will zoom past Pluto at a distance of just 7,800 miles (12,500 kilometers), capturing supersharp images of its frigid surface. Pluto is just one of many denizens of the Kuiper Belt, the ring of frigid bodies beyond Neptune's orbit. So New Horizons' observations should help researchers better understand an entire realm of little-known worlds, mission team members have said. "The Wait" was written and directed by a team at the Southwest Research Institute in Boulder, Colorado, the home institution of New Horizons principal investigator Alan Stern. Stern served as executive producer for the video.